One Fine Day: Glittens Galore! I have no real need for gloves or mittens at the moment. It's a shame, really. 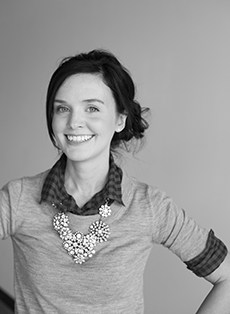 I love a reason to accessorize, and I've seen a lot of cozy and charming options in stores and online. 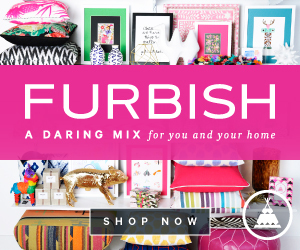 Pom-poms, frills, fair isle, and stripes — I'm left pining for a reason to wear them! One of the perks to blogging is the chance to live vicariously through posts and bloggie friends. I thought I'd take the opportunity to share my favorites. Perhaps you're in the market for a new pair? Rib-Knit Mittens // A bargain buy adorned with metals bows! Adorbs. Vivienne Westwood Leather Heart Gloves // Pricey, but precious. I just had to include them. 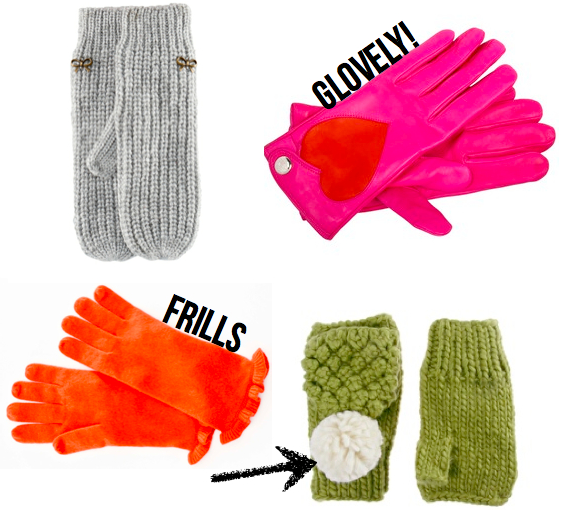 Cashmere Short Gloves // Love that ruffle on the wrists! Pom-Pom Mittens // These just look cozy and fun. I'm a big fan. Cable Pom-Pom Gloves // Chunky and knitted. That sounds like perfection. 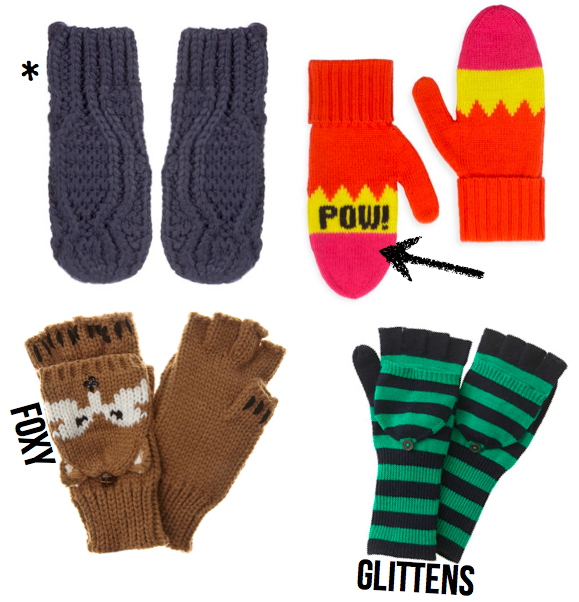 Pow Pow Mittens // These are cheeky and pack a punch. Fox Converter Gloves // Can't help but think of You've Got Mail. F-O-X. Stripe Merino Glittens // And they're on sale... Good deal alert! 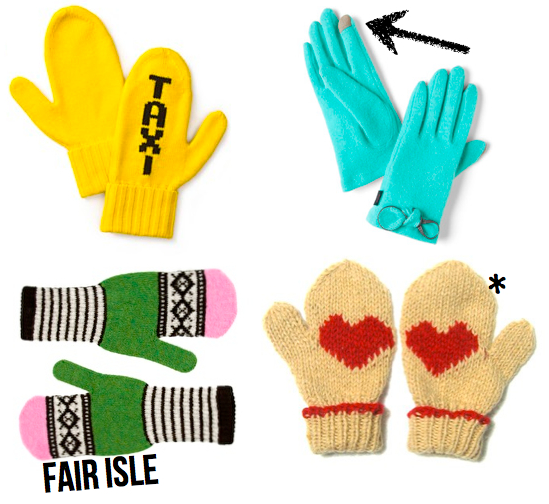 Big Apple Taxi Mittens // Leave it to Kate Spade to come up with something so charming! Tech Sassy Gloves in Turquoise // Accessing your phone is a must. Fair Isle Mittens // It's such a fun color combination. Fair Trade Heart Mittens // It feels like I should be in a Jan Brett book with these mittens. Red Birdseye Mittens // Another cute pair with a great price tag. Stripe Cuff Glove // Classic stripe details in a lovely shade of mustard. Wool-Angora Colorblock Gloves // Super soft and cozy. Mama likes! 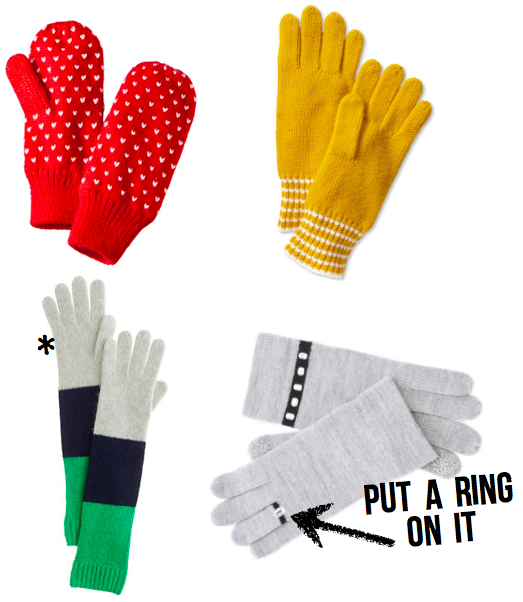 Trompe L'oeil Gloves // Shoulda put a ring on it.